Today our volunteers were called out to a location to save an injured kitten (approximately only 6 weeks old). When they got to the scene, they found this little girl with an extremely nasty open wound with broken bone protruding. Despite her pain and circumstance this little lady was still very much mobile and incredibly friendly and affectionate. She has been rushed to our emergency veterinary centre and will need to have her leg amputated. As a branch we are still in the throws of ‘kitten season’ which are already consuming are large portion of our funds and resources, along with the steady influx of older, stray and injured cats. 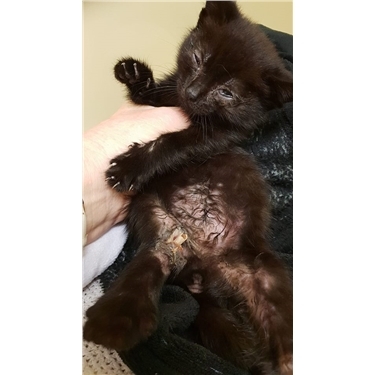 This appeal is to help raise funds for Hoppy’s operation and after care. Any monies raised which exceed this amount will be used to fund other cats and kittens under the care of Gwent Cats Protection branch. If you can, please make a donation, if you are unable to donate, please share this appeal to help us reach our goal. Thank you.